A Sushi Lounge with a twist! Board the current and embark on a tantalizing journey that is bound to stimulate all of your senses. Come to Current and savor the legendary Dragonfly sushi or dine on the succulent small plates and skewer offerings from the Current kitchen at the helm of Kitamura Toyoaki. 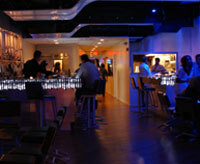 Current blends its fun and edgy atmosphere with world-class and classical sushi and modern Japanese fare. Its dining menu blends the best of Japanese cuisine with exotic and bold international influences. Current's expansive menu is supplemented by a diverse range of artisanal and delicious Sakes. Come and enjoy your culinary journey aboard the Current. 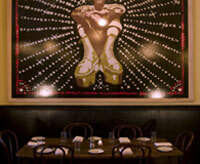 Located in the Shaw area of D.C., Marvin serves American comfort food and a few soup-inspired dishes (shrimp and grits), and is named in homage to Marvin Gaye - a huge mural of Marvin is painted on a main dining room wall. The restaurant decor gives some of the feel of a traditional local place, with a cool vibe as you enter the upstairs lounge. There is no denying Panache's elegance. 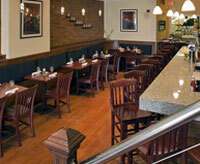 The walls are done in a soft shade of wheat, the bar is long and sleek, and bouquets of flowers dot the dining room. But this is a restaurant-lounge with a wild streak: The dining room chairs are bright yellow, funky-cool artwork hangs on the walls, and some weekend nights, the line to get in stretches down the block. It's a jolt of energy across the street from the quiet Mayflower Hotel. 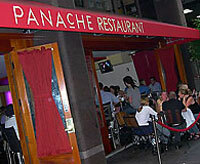 Panache serves a range of small plates that make up a gustatory tour of Europe and beyond. Diners can also order one of the larger plates, which include seared sea bass with sour cherry fig sauce, and rack of lamb with pommery mustard and ancho-mashed potatoes. This little, yet grand, restaurant is becoming part of the Dupont Circle culinary infrastructure. 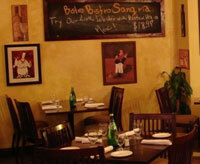 Bistro Bistro offers an exquisite French cuisine. The Bar stools will make you feel as comfortable and relaxed as you would at your home. Our dining room upstairs offers a unique view through the large balcony that opens on the beautiful historical old houses of the neighborhood. Our private room can accommodate up to 75 guests with two private wide screen TVs for your special presentations. Our 4pm - 7pm happy hours include Martinis for $3.95, glass of wine for $2.50, beer for $2.50 and mixed house drinks for 2.95...bring your friends and let's make a toast to our long shared memories... a la votre! Ulah Bistro will tantalize your taste buds with delectable American cuisine, such as fresh, brick oven pizza, at our bistro in Washington DC. 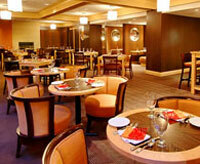 Ulah Bistro offers a wide variety of modern American cuisine for both dine-in and take out. Our experienced chefs prepare all of our foods fresh daily, and we utilize more than 20 years of experience to bring you delicious food, excellent service and good times.